Members of the Just 4 Fun Bowling League at their end-of-the-season banquet. Finding things to do during the winter months is not always easy, and it can be especially difficult for children with disabilities. The Just 4 Fun Bowling for Children with Disabilities began because Pamela Bell saw there was a need for children with disabilities to grow socially in the winter months. She then thought of bowling, got together with others to discuss the possibility and so it began, the formation of The Just 4 Fun Bowling for Children with Disabilities. 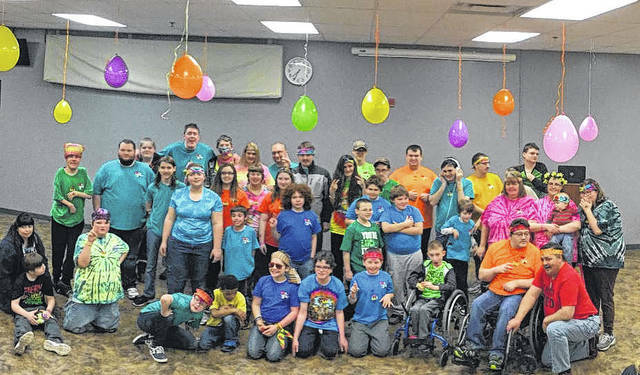 The Just 4 Fun Bowling for Children with Disabilities recently held its seventh annual end-of-the-season banquet at the Scioto County Welcome Center. The banquet was another huge success for the children. The banquet had a hippie theme that included music, food, prizes and even had a cardboard Volkswagen bus reminiscent of the 1960s counterculture. To conclude the banquet, each bowler received a trophy for their excellent bowling skills. The Just 4 Fun League competes September through February, and registration usually starts in August. It is open anyone under age 22 with a disability who is enrolled in school or a school program. The league has available to it fully accessible bowling ball ramps. Half is played with a bumper, and half is non-bumper. There is a nominal fee of $50 per season, with the money going for team shirts, shoes, obtaining of trophies and costs associated with the banquet, however, no one will be turned away for financial reasons — the league will work with parents to overcome monetary obstacles. Members of the Just 4 Fun Bowling League expressed its appreciation to the Community Action Organization of Scioto County for the agency’s support, as well as league sponsors Autism Project of Southern Ohio; 4-H Down to our Boots Club; Sunset Lanes; Hickie’s Hamburger Inn; Mary’s Spirit Shop; Amvets Post 95 and Amvets Post 95 Ladies Auxiliary; McCulley, Eastham & Associates; Harris Floor Covering; Book Bros. Marine; Shawnee Computers; Elegant Miss Productions Pageantry (Amy Spradlin, director); Hunter-Williams Insurance; Charles & Mary Vaughn; and an anonymous donation in memory of T.J. Caudill. Due to generous donations, the league competition and banquet made many children smile. The Just 4 Fun Bowling League was formed in 2010. The league is already planning its next season. For more information, call Pamela Bell, president of the league, at 740-352-0176, or contact Teresa Ketchell, vice president of the league, on Facebook via her personal account or Just 4 Fun Bowling.